My mom has worked really hard throughout her life. As the oldest sister in the family, she shouldered the burden of raising her brothers and sisters since young, sacrificing the opportunity to go to school just so she can bring some money back home. Even after she was married to my dad, she did not enjoy a blissful marriage. Somewhere along the line, the relationship between my mum and my dad soured. Being a strong, independent woman, she decided to work night-shift so as to avoid as much contact as possible with my dad. That also meant that we did not get to see her much for the most part of our lives. 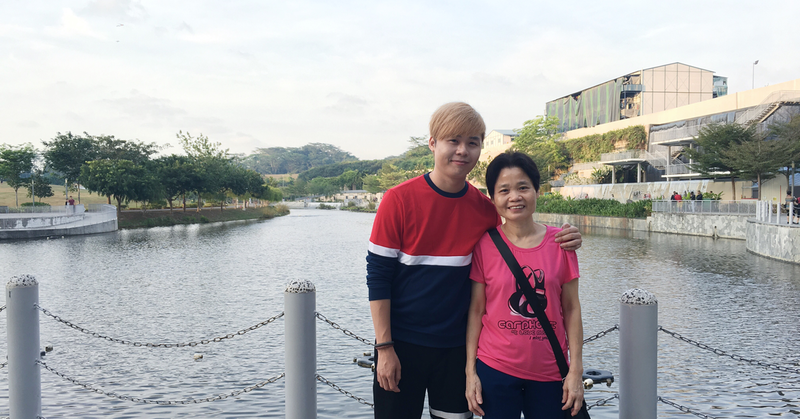 Whenever my sisters and I wanted to plan for a family outing, my mum would not be free because of her work schedule. Even when we could gather, it was always just 2-3 hours, before she leaves for work at night. When I was in my early twenties, my dad suddenly stopped contributing to the household. My mom, once again, had to shoulder the burden of raising us almost single-handedly. She took on two, sometimes three jobs, and slept less than 4 hours a day for at least 10 years, just so we could go to university. After slogging her guts out for the past few decades, my sisters and I finally graduated from our studies and stepped into the corporate world. Just when she thought she could finally get her well-deserved rest and fulfill her dreams of flying around the world... she started getting intense pain around her stomach. She could not eat, and worst, she could not even drink water because it would be extremely painful. I still remembered that day, when I first saw my mom on the hospital bed - weak, pale and with needles protruding out of her frail arms everywhere. The first thing she said when she saw me? My mom has been one that has never wanted anything. Because of her strong facade, we always thought that she is okay. However, after this happened, I realised that my mum has never been pampered. As I am typing this, I recalled that when I was young, I used to love arcades. I would always pester my mom to bring me to arcades, despite daytime being her rest time since she worked the night shift. She would then find an empty game machine and just fall asleep on it while I spend at least 2-3 hours playing... My mom is seriously the greatest. As a woman, my mom has never gotten any jewellery from anyone. I thought that getting my mom a piece of jewellery might make her feel like a princess, or at least, the blissful feeling of owning one. Honestly, if you have shopped online, you would not need any tutorial for this jewellery e-store because the procedures are similar. But I am going to tell you why you should shop for jewellery online. Let's face it, us guys have zero knowledge about jewellery. The only thing that we probably know is that the bigger the carat, the happier our fiancee/wife/girlfriend/mom. To me, jewellery shops have this huge force-shield that makes it daunting for me to enter. "Will I appear stupid? What should I ask? What am I even going to do inside?" Shopping online solves the shield problem. Firstly, the user interface on the SOOKEE e-store is clean, neat and intuitive. You would know which section to navigate to at first glance. When I was shopping for the gift for my mom, I came across a lot of terminology that I did not understand. What is colour? How will the cut or clarity affect the diamond? Thankfully, the e-store has included lots of helpful prompts and guides for noobs like myself. If I still need more help, there is a live chat button at the bottom right corner that will connect you straight to one of the professionals. How awesome is that? "I customised this diamond ring for you, because the one and only in my life needs to have the one and only ring"
If you are able to get a photo of your fiancee/girlfriend/wife/mom hand, you will get to see how the ring will look like on her finger. I find this feature really useful, because everyone's hands and fingers are different, which means some designs might suit a certain hand shape better. One should always spend the time and effort to look for that piece of diamond ring that fits her perfectly, because, afterall, wedding rings are for life. 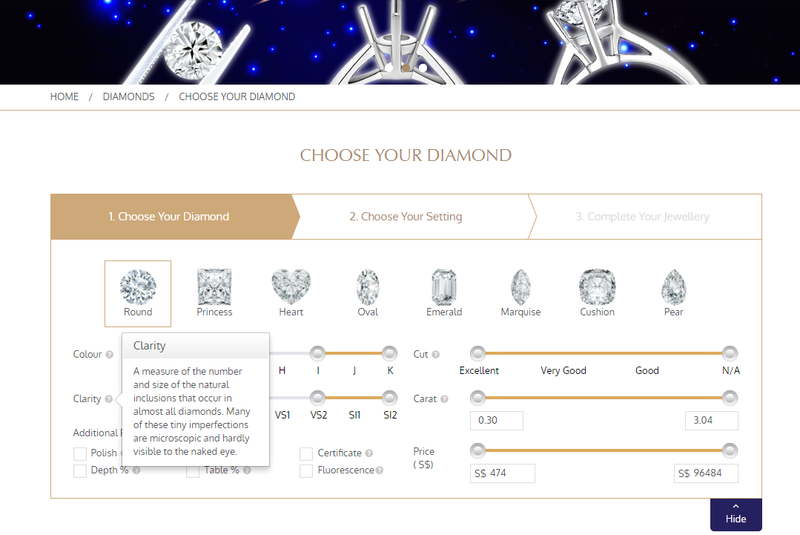 Another feature of the online store is the ability to view the GIA Certificate online. This is a certificate which gives you an accurate description of your diamond, and ensures that you are making an informed choice before committing to the purchase. 1. You will know exactly what you are buying. Every important factor you need to know about the diamond is described in the certificate. 2. The seller knows exactly what he/she is selling to you so as to avoid any misunderstandings in the future. 3. 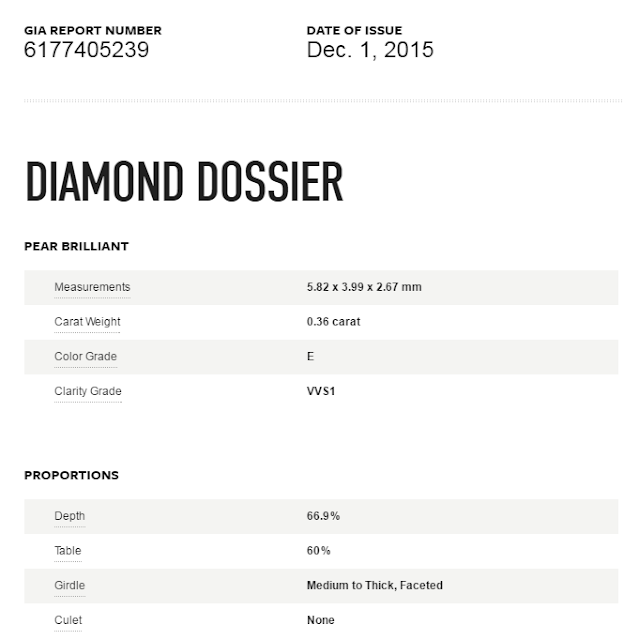 If a diamond comes with a GIA certificate, you will not become a victim of buying a synthetic diamond. Yes, there are real man-made diamonds that hit the market back in 1977. Currently, average jewelers have no way of telling if a diamond is natural or man-made. 4. 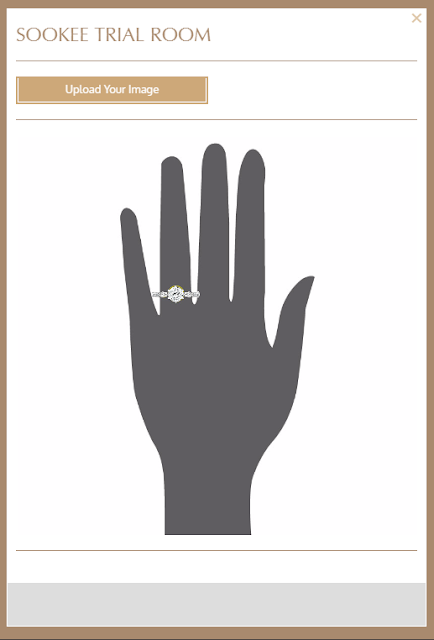 Purchasing a GIA certified diamond will simply provide you with much more confidence and value. 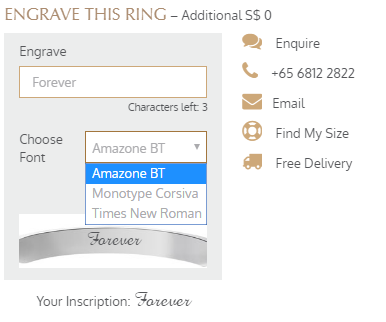 This is another cool feature which can only happen online - the ability to preview your engravings on the ring. You can even choose the font you would like your inscription to be in! The third reason why you should purchase from SOOKEE is their attention to after sales service. Not only do you get complimentary courier delivery and insurance with every order, you are also assured with an in store 7-day exchange policy at SOOKEE outlets. Plus, they are really pretty! My mom didn't want a diamond ring, so I got her a beautiful gemstone pendant that is adorned with 10 side diamonds that are approximately 0.04ct. My mom didn't want to have her photo taken, as she has since lost most of her hair to chemo. Nevertheless, I could see that she was really happy to receive it, from the glint in her eyes. The necklace also took some attention away from her balding head! This has to be one of the best gift I have given her so far. Thank you SOOKEE for the wonderful piece of jewellery! EXCLUSIVE SOOKEE ESTORE PROMOTION FOR MY READERS! Create your own diamond rings, pendants or earrings for yourself or gift them to a loved one! 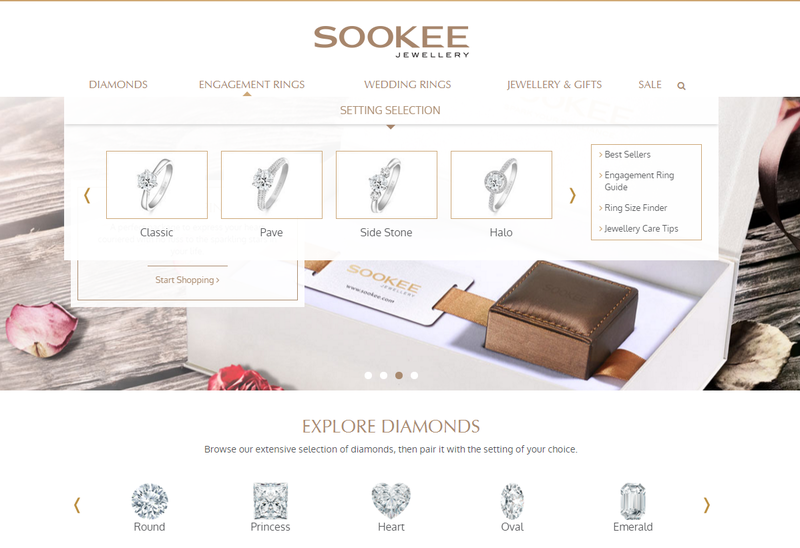 Simply use my personal promo code "joey$100sookeeestore" at https://www.estore.sookee.com/ for $100 off your SOOKEE customised diamond rings, pendants or earrings. Valid with diamond settings above $500, till 30 Sept 2016. I am really sorry for your mom, but it is great that you've decided to make her a little present as a symbol of your love. Follow the link, if you want to share your opinion about that. Longplay - Falling in love with Bar Grubs!